Website Payment Problems…Head Still On Straight? Just what is the goat lady up to today? The rolling head, still on straight? Has she lost her mind completely? Nah! Just almost. Actually, I began the day by cutting the large batch of lemongrass poppyseed goat milk soap I made yesterday. It looked so pretty I picked up my phone and clicked a pic before the soap bars headed to the curing rack. Afterwards, I made two large batches of goat milk soap. The first unscented. Seems rather popular these days. The second batch is lavender rosemary. Purposely, quite a bit lighter on the rosemary end of the soap this batch. Rosemary is a wonderful essential oil. I love the scent, but it also has such good skin care properties, such as antiseptic and assistant to dandruff and scaly skin. But it sure can wake up the old nose! Then the day broke loose. The head starting spinning, rolling along (as I told Alix of Casa Hice) in an email. If you experienced payment problems today, if the website did not accept your payment, or if you ever do experience problems, please carefully note what occurred and give me a call, or shoot me an email. As we all know, one tiny problem can mean one big problem is brewing. Luckily all of the customer payment issues were told to be unrelated, but my doubting mind (because I want perfection) still wonders…but life rolls on (and right now it feels like my head is off rolling somewhere). I had a great conversation with a good customer from California today. Yesterday her husband asked, “Do we have any more of THAT soap?” The phone call was rather on the desperate end. The payment was not being accepted and the husband wanted more of THAT soap. People that call me get what they get, they get me, I am never going to try to be anyone else. If I break out in laughter, please laugh along with me. This is one short life, and I intend upon making it all that it can be. We got the order resolved, and Mr. CA is going to have some of THAT soap to shave with. By the way, THAT soap is Moroccan Dreams, and Sandalwood Blend, as well as Patchouli Blend. Mr. CA shaves with THAT soap. So do I (my legs love it). Have a beautiful evening, day, morning, whenever you read this…and if you find my head anywhere…treat it nicely. I need it folks! on June 19, 2009 at 2:59 am | Reply KathyB. Mary, I always love the perspective you offer. 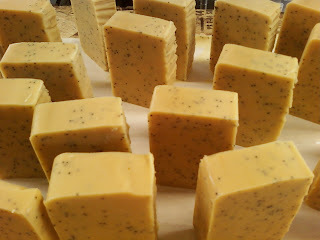 I also love the lemon poppy seed soap and the rosemary lavender was chosen by my daughter A.Joy as the soap she wanted . ( I ordered it for her ) and she loves it. Her husband is using the soap too. I hope you worked out the kinks with your payment system. Mmm….these bars look almost good enough to eat. Sorry to hear of the website problems and the mower hang-up! Stuff happens, that's for sure. Kathy, figuring out what to keep can be daunting. That soap is a keeper for now. Thank you! The payment system problems have been resolved, and were unrelated. Now I am dealing with Windows Explorer 8 and Blogger. All will smooth out! Oh dear god, now I need Moroccan Dreams to add to my collection. Mary! I need to buy stock in Annie's Goat Hill so I can get dividends on the soap I buy. Oh, my goodness…now I have to think about stock options, profit sharing, and I need a board of … something or another. Alix!!! !